Art Nouveau Brooch - Can You Help with Any Info? 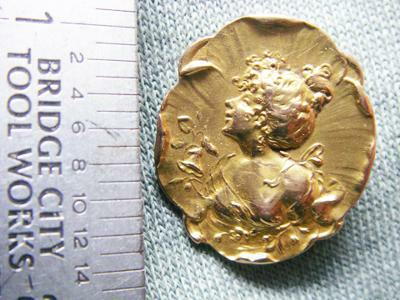 I have a small gold art nouveau brooch/pin. It is hollow cast, with a flat back. The theme is a highly decorated woman with hair, clothing, vines and other high art nouveau styling. My guess would be French, turn of the century. I have not tested the gold, but the color looks very 18K. It weighs 3.57 grams. The front has been buffed, but the back shows the age of the piece....with various small scratches and insults that you might expect with it's age. There are two very tiny hallmarks on the clasp. One is the head of an eagle (or possibly a gryphon) looking to the right. The other is a four sided diamond that appears to have the letters A and L, separated by two ice cream cone shaped objects between them. One cone points up, the other is rotated 180 degrees and points down. It is also possible that the A is really an inverted V. But I am going with the A. Any info you can offer would be greatly appreciated. Thank you in advance.